See the Groupworks post by Jayne Namerow for more information. A successful block drive gave the group many extra blocks and a second quilt a made by Carole Lyles Shaw and Christine Ravish. 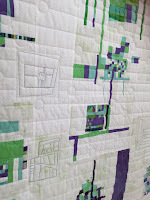 Quilted by Carol Byrnes. We voted at the Jan 2019 meeting to donate it to the Sarasota County Healthy Start Program. It will be auctioned off at their yearly Fundraiser on January 31, 2019. A big thank you to all !!! Charity Quilt for QuiltCon 2019 - is finished!!! A big thank you to Carole Lyles Shaw for the ideas, organizing, sewing, and finishing to send off to Nashville! And a beautiful quilting thank you to Robin Kreigs for the modern stitching just perfect to set off this tiny pieced block style quilt. And THANK YOU ALL for the block contributions, piecing and layout design. It will look awesome in the QuiltCon 2019 Charity Quilts display. The MQG Charity Quilt Top #1 is complete and at Robin Kriegs to longarm. A second quilt top is forthcoming as there were enough blocks for a second quilt. Many thanks to Carole Shaw for leading this effort and for her amazing design skills! 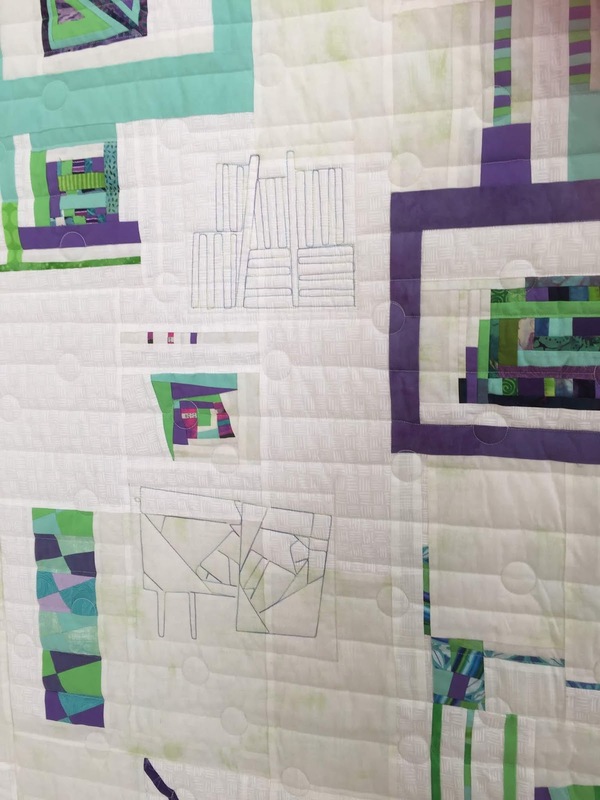 The Charity Quilt Committee post dated May 7 on MyGrove has all of the instructions for the block that members are to make for the Charity Quilt for QuiltCon 2019. (I found the pdf download instruction pages 3 and 4 to be most helpful).The August and September the afternoon program time was used to design the challenge quilt layout. Many thanks Kathie Hayes for her beautiful piecing of the side panels. Robin Kriegs will longarm quilt the finished top. And thank you to the committee and the many design helpers. 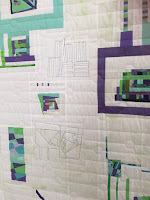 It's going to be an awesome modern quilt! FABRIC DISTRIBUTION: Packets of fabric were available at the MAY meeting. These fabrics are the colors that we are using and you can add your own fabrics according to the instructions. NEED FABRIC MAILED? : If you were NOT be able to attend the May meeting, email Carole Lyles Shaw through MyGrove and we will send the fabric to you by regular mail. Color Club - on summer break! 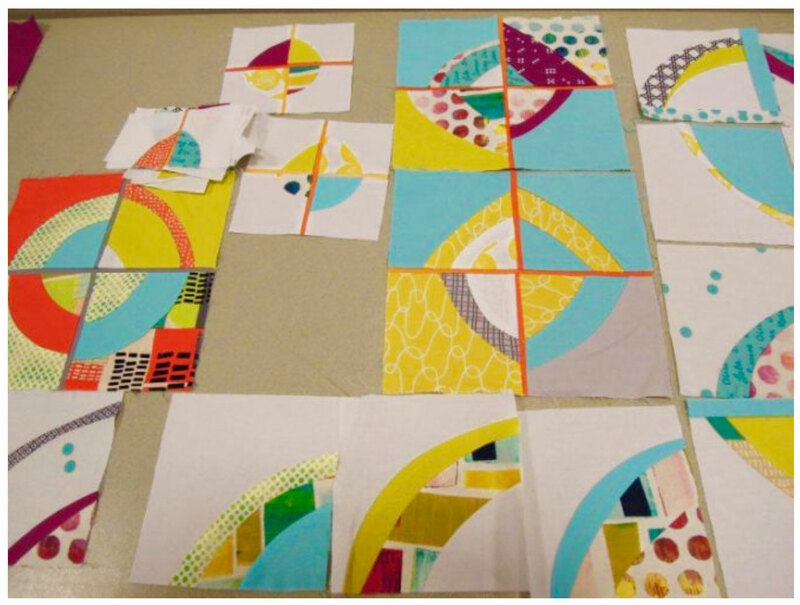 Color Club is a study and discussion group on how color and placement affects our quilts. For more information contact Jayne Namerow thru MyGrove. The Color Club will meet again in the Fall of 2018.